Timelessly elegant, this diamond pendant is set with a third carat diamond solitaire and crafted in shining 18ct white gold. A feminine design and a timeless classic. 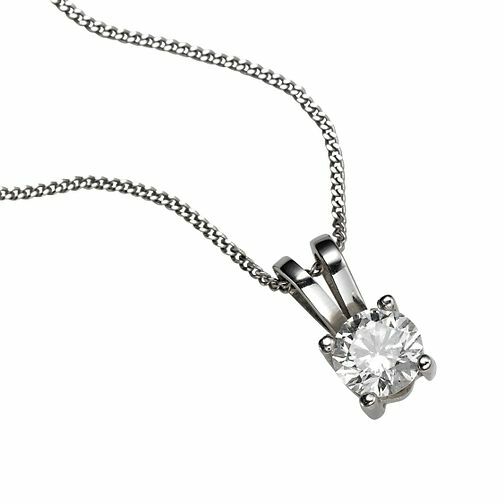 18ct white gold third carat diamond pendant necklace is rated 5.0 out of 5 by 2. Rated 5 out of 5 by Anonymous from Beautiful and Stunning. Purchased for my partner for her 50th Birthday. Looked in other Jewellers but was impressed by the design, clarity and elegance of this 18ct white gold 1/3rd carat of diamond. She is constantly getting positive comments of the sparkle. Pleased I purchased from Ernest Jones and hope to purchase the matching earrings in the very near future. Rated 5 out of 5 by Mrsbocky from Excellent product, excellent price, very fast delivery Stunning necklace. Looks great worn with anything.